Question: My child loves her class at Chicago Blue Dolphins, but the focus is on songs, games and toys. I feel like we can do a lot of that on our own in the summer. Wouldn’t she learn more from a skills-based approach? When children are happy and enjoying learning in their swim classes, the skills become ingrained in a positive way. This leads to stronger, higher quality swim strokes as they develop. Answer: Great question! I hear that one a lot. At Chicago Blue Dolphins, our swim classes use a child-centered approach instead of a skills-based one. This is especially true of our infant and toddler swimming classes. Songs, games and toys bring joy to the learning process, which helps the children learn faster/better and eliminates pressure, anxiety, crying and coughing. I adopted the child-centric philosophy nearly a decade ago, and we’ve had wonderful results. When a child is happy and enjoying learning, the skills become ingrained in a positive way, and this leads to stronger, higher quality swim strokes as they develop. I understand that skills-based training is attractive to parents because it’s easier to see the “swim lesson” when the instructor is teaching specific body movements and breathing exercises. Practicing the “monkey walk” during an infant and toddler swim class. However, I believe skills‐based programs miss a key point: Infants and toddlers don’t learn the same way as older children and adults. Infants and toddlers learn best through play, song and imagination. Think about your a typical pre-school: You won’t see 2-year-olds sitting in rows of chairs conjugating verbs in Latin. You’ll see them playing, singing songs, and using their imagination. At Chicago Blue Dolphins, all of the activities we incorporate into our classes are building toward underlying swimming skills and strokes. The games, songs, and toys “distract” the children, let them use their imagination, and take away the pressure and anxiety of learning. The skills sneak in—along with joy and a life-long love for the water. Getting ready for a jumpy-jump during swim class. Our major philosophical objection to skills-based programs is they allow instructors to force the skills on a little child. Infants and toddlers don’t have a lot of words. Their small stature makes it easy for an instructor or parent to physically force immersions, back floating, and front-to-back rolling. When a child comes up crying, sputtering or coughing, an instructor can say that it’s part of the learning process, and the little one doesn’t have the words to lodge a protest. In aggressive, skills-based programs, instructors teaching survival swimming will even say that “a little crying now is better than having your child drown and never hear her cry again.” This type of aggressive approach violates the dignity and trust of a child. It’s unnecessary, and it doesn’t produce a safer and better swimmer. It produces stiff and robotic movements and an underlying fear of the water and teachers. Imagine learning to swim as an adult from an instructor who takes you in the deep end and dunks you repeatedly, teaches you skills that you aren’t ready for, and then tells you “it’s part of the process” when you cough and throw up water. You would probably ask for your money back after that first lesson. The table below draws a comparison between child-centered and skills-based learning approaches. We’ve drawn it from our mentors Rob and Kathy McKay’s amazing baby swimming book, Learn to Swim. When I decided in 2009 to start a baby swimming program, I looked for a child-centered curriculum because it matched my wife’s and my philosophy on raising our daughter. I was overjoyed when I found the McKay’s Lifestyle Swim School in Boca Raton, FL. When I read that they had taught about 17,000 babies, I figured they knew what they were doing. It’s been 8 years for us, and I haven’t had a single regret with selecting a child-centered, play-based, gentle program. The laughter and smiles I see in our baby classes every day just deepens my conviction. 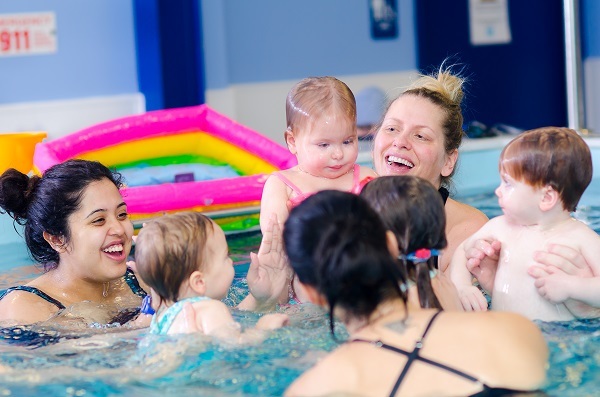 For more information on our child-centered swim classes, review our Infant-Toddler page. You can get started with the fun by contacting our office or registering online. We hope to sing “Wheels on the Bus” with you and your cutie soon. P.S. If you have any questions or comments about child-centered vs. skills-centered programs, please feel free to email me.